This week, Leiden University is hosting the 15th International Conference on Advances in Computer Games. Apart from Chess, it is interesting to see how many different games are participating in the event. After looking at a list of games (huge!) 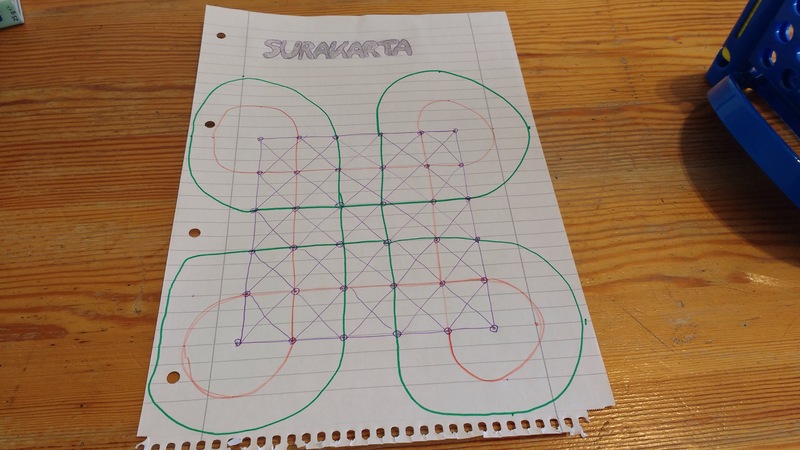 I found the game of Surakatra that apparently was played in one of the earlier computer game events. A new strategy game, well for me at least, as I never saw or heard about this game before so what to do on a sunday at home with kids? Try it out! Capturing can be done if you can directly land on an opponent piece via a loop. The 6×6 board has dots and a dot can contain one piece only. The game starts with both players having twelve pieces, or marbles placed on opposite sides of the board. We played a few times and found it takes some practice to understand the flexibility of the loops. Once both players are occupying, say the red trail with pieces, we found players can have multiple capturing moves in a row, each taking turns of course! The spaces in the centre that have both red and green loops are very dynamic! A nice little game! Easy to understand, very dynamic in capturing moves. The loops make it difficult to see what is going to happen. 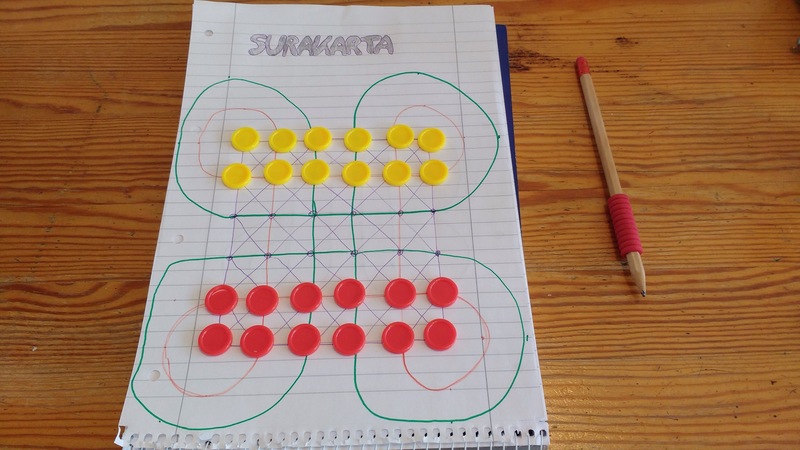 Complexity and simplicity makes Surakatra (wikilink) a very good addition to our game repertoire. 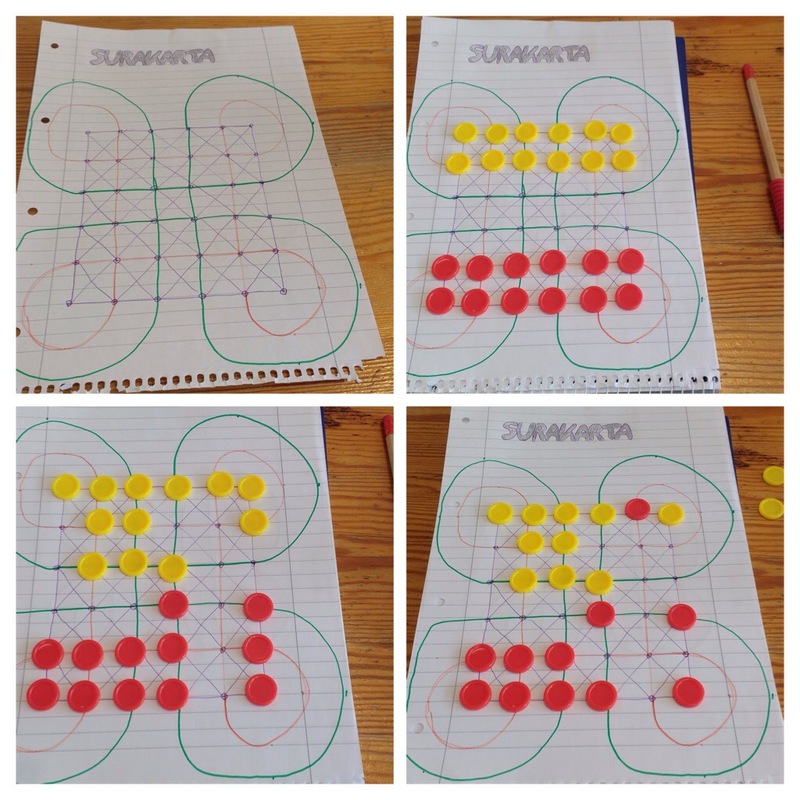 Playing #indonesian #strategygame #surakarta with kids in the #netherlands by drawing the #board ourselves! Kids win: less fun!